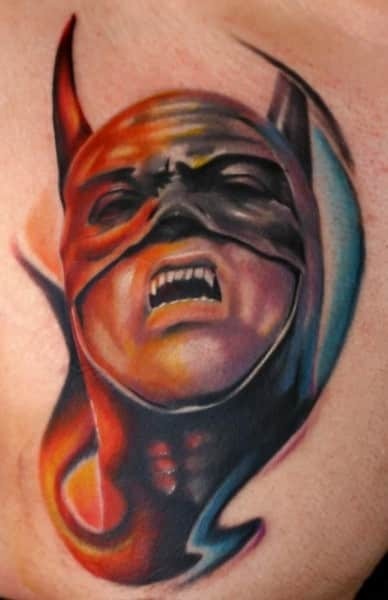 One of the best Batman tattoos for guys, this represents the hero in both hot and cool colors. With half his face inked in shades of red, orange and yellow, the other half shows the usual blue that normally goes along with the black. 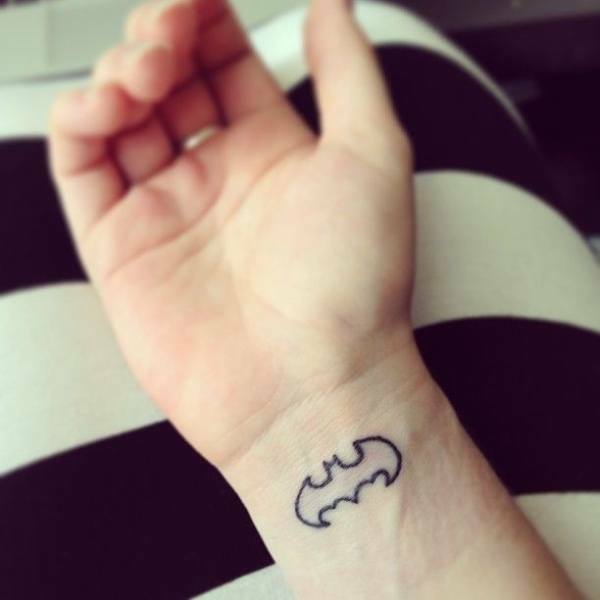 This awesome wrist tattoo shows the simple Batman logo inked on in solid black. While this is the perfect way to embody your love for the masked hero, it is also easy to cover up with a watch or long sleeves, making it ideal for corporate settings. If you’re tired of the simple Batman logo, but want a minimalist design nonetheless, this might just be it. Depicting the Dark Knight’s head on the top of the logo, the wings are done in solid black. Within them is inked ‘BATMAN’ in bold, red, letters to create a brilliant contrast. 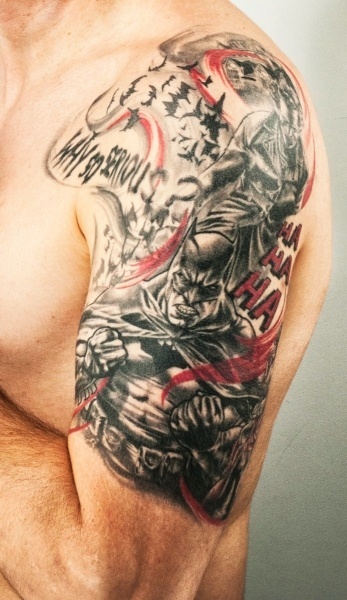 This red and black tattoo embodies the deadly struggle between Batman and Joker. Here you see the masked vigilante as he struggles to defeat his arch-nemesis. Surrounded by the Joker’s words, the super-villain himself is laughing gleefully in the background. 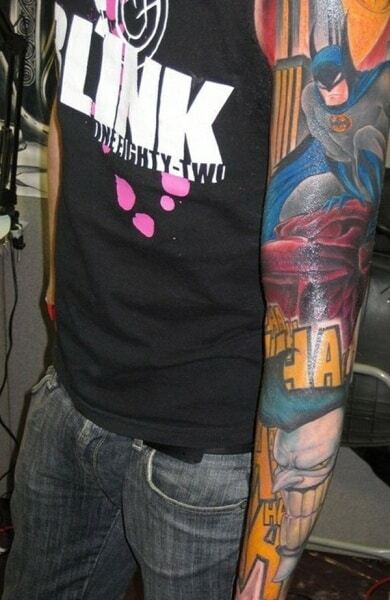 This colorful tattoo is an incredible way to make the comic books come alive. It creates a collage of various scenes, representing Batman, the Joker, Gotham, and even the Bat-signal. The bright colors are sure to make all heads turn as they attract all eyes upon themselves! 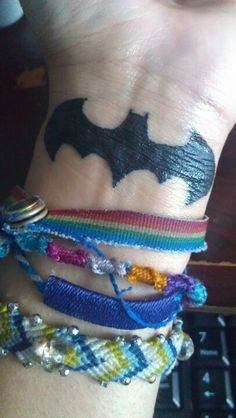 If you’d like to embody your love for the Dark Knight without any elaborate tattoos, this minimalist wrist design might just do the trick! Done in black ink, it simply outlines the classic Batman logo as a wonderful tribute to the hero. 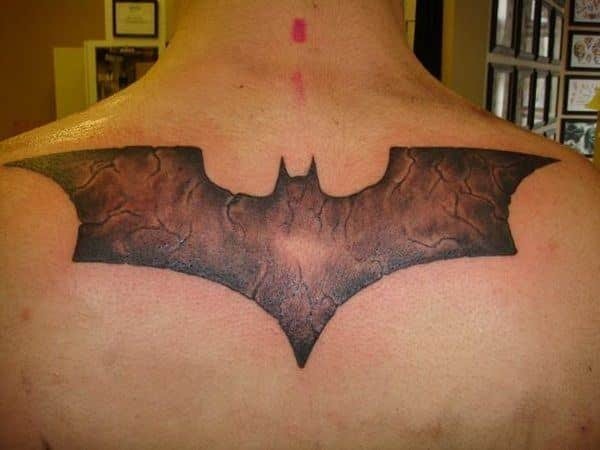 One of the best tattoo ideas for men, this awesome back design shows the batman logo. Done predominantly in black, it depicts cracks extending throughout the design with the very core being tinged in red. 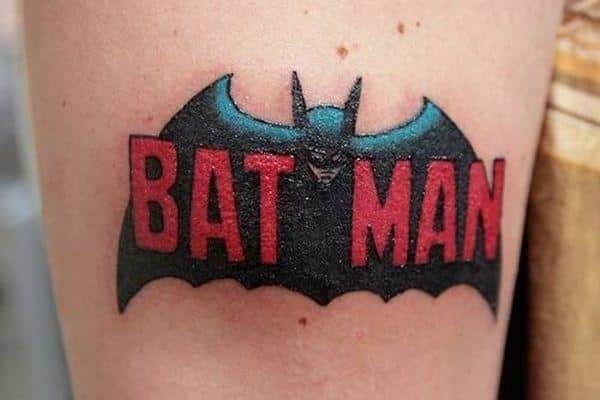 The tattoo shows the undying love for one of the first realistic superheros! 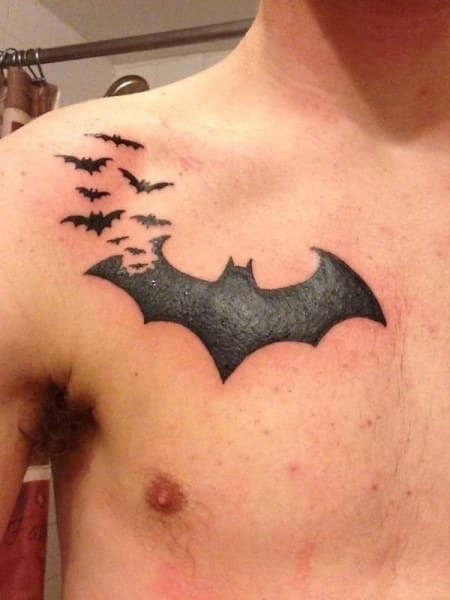 This innovative chest tattoo depicts the batman logo disintegrating into small bats as they fly away. While the black ink forms a sharp contrast against the skin, the tiny bats could be considered symbolizing the wealthy superhero himself – looks like Gotham will be safe tonight! 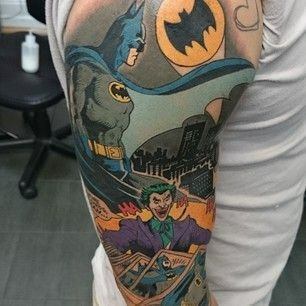 This arm tattoo is every Batman fan’s dream. With the Joker at the bottom surrounded by his evil laugh, you can see Batman perched atop a gargoyle. The bright colors represent the comic books themselves as the two characters depict the power struggle between good and evil. 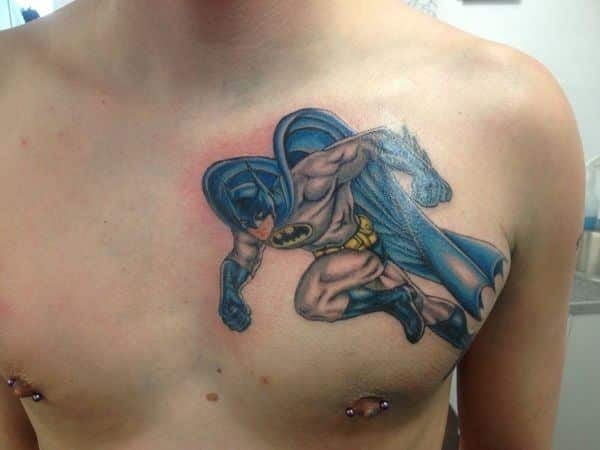 This brilliantly colored chest tattoo shows Gotham’s savior in action. Perfectly outlined, it highlights each muscle as the superhero leaps to save the day. Moreover, the intricate shading gives it a 3-D effect, ensuring that the character comes to life!